Having battled through the season’s mixed bag of early semi-classic races which have already encompassed Italy’s dusty gravel roads and Northern Europe’s treacherous cobbled climbs, Milan – San Remo signals the curtain truly being raised on 2016’s scramble to claim racing’s rarest of victories; a monument. Throughout its previous 100+ editions, the route linking Milan to San Remo has remained relatively traditional, fluctuating only in regards to the amount and whereabouts of climbs en route to the finish. This has shaped the nature of the race for obvious reasons, but this year’s 291km affair should stick to the anticipated script of setting the race alight upon the double of the Cipressa and Poggio as ever. This year’s course lacks the tinkering from organisers we have seen recently when sandwiching an extra climb into the finale, and given that the finish line is once again upon the historic Via Roma, the sprinters will fancy dominating this traditional looking Milan – San Remo. The Cipressa is 5.6km in length and sees its average gradient of 4.1% swing up to 9% for a time, though it ultimately remains a manageable task during these latter stages of the race. The tricky descent from the top will leave only 20km left to tackle, returning to flat roads before beginning the decisive Poggio 9.7km from home. This infamous climb is 3.7km in length with an average gradient of 3.7%, though its ramps reach 8% at times during the ascent. Attacks over the top are expected and it is this combined with the incredibly twisting descent which will make it tough for the sprinters to cling onto those attempting a late breakaway move. 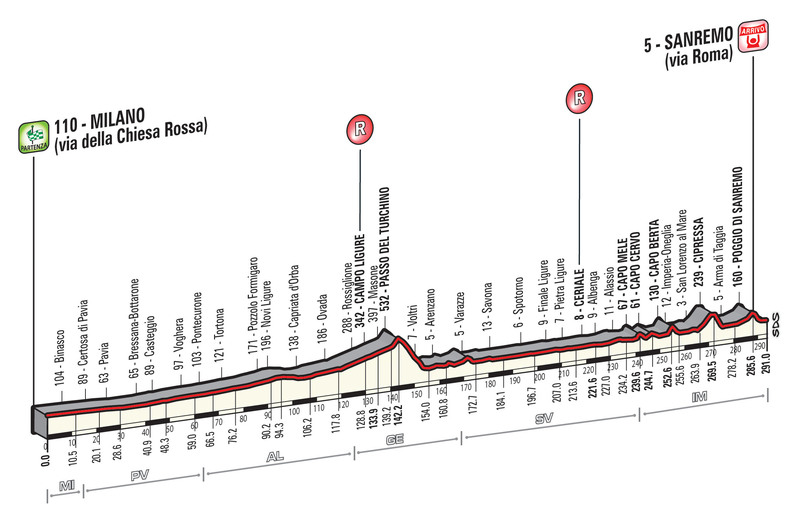 Just over 2km of flat road will lead the riders onto the finish of Via Roma, a finishing straight of 750m setting the scene for what is expected to be a memorable sprint finish amongst the day’s favourites. Michael Matthews put in a great showing at last year’s World Championship Road Race and has continued that form into 2016 by demonstrating his expansive skill-set, one which features a potent blend of climbing and sprinting capabilities. Having already reached the podium at this race, there is no doubt he can make the cut, especially in a year which suits sprinters more than any other in recent history. Matthews has the ability to follow a late escape as much as he does to duke it out in a sprint, either way, he looks to be the man to beat in the absence of defending champion John Degenkolb. Alexander Kristoff no doubt has the skills to chalk up another win at Milan – San Remo, but it is the team which supports him in 2016 which raises doubts. The biggest hole which Katusha shall struggle to fill is that of Luca Paolini, the Italian a crucial part of Kristoff’s plan in the pursuit of any major win, but a crucial lieutenant he will have to go without this year. Regardless, Kristoff is likely to be the fastest in a bunch kick, but the greater strength and depth seen in the teams of his rivals’ could prove difficult to match late on. Peter Sagan is still bereft of a classics win, but his form as of late on similar terrain should provide him with great encouragement to remedy that. However, Sagan seems to find a way of losing despite his fantastic positional skills and ultimately superior sprinting ability. For fans of the sport, a Sagan win would be excellent, but there remains a lingering doubt as to whether he can execute such a race to perfection; be that from a elite group move or larger bunch sprint. Fernando Gaviria is by no means an unknown quantity when it comes to the WorldTour as of late, but his ability to contest the win over this distance is uncertain. The Etixx-QuickStep rider climbs extremely well, a talent only surpassed by his ability to dominate a sprint finish with tremendous speed. An easy ride into the final 20km will play into his hands well and he shall remain a serious contender if still present at that stage of the race. Greg Van Avermaet has seen his form soar as of late and will be eager to hammer home such condition in pursuit of the win here. However, the Belgian will struggle to both drop his major rivals and also better them in a flat drag race to the line; a win would be extremely impressive given the company. Fabian Cancellara is in fantastic form currently and shall do his utmost to add a major win to his palmarès before signing off into retirement at the end of this year. Though his physical prowess may have altered somewhat in recent years, the Swiss legend is wilier than ever, meaning he cannot be given an inch to attack in case of making it all the way to the line. Posted on March 19, 2016 March 19, 2016 by Spokenforks	This entry was posted in Classics, News and tagged 2016, Alejandro Valverde, Astana, BMC, Cipressa, Dimension Data, Etixx-Quick Step, Fabian Cancellara, Fernando Gaviria, Greg Van Avermaet, Mark Cavendish, Michael Matthews, Milan - San Remo Preview, Milan-San Remo, Movistar, Orica-Greenedge, Peter Sagan, Poggio, Preview, Stephen Cummings, Tinkoff, Trek-Segafredo, Vincenzo Nibali, Zdenek Stybar. Bookmark the permalink.